Some special metals actually seem to have a "memory" for their original shape. One of these metal is called Nitinol and you can use it to observe some pretty cool things. The following activities will help you discover what you can do with nitinol, the properties of nitinol and phase changes. We hope you enjoy these activities and do them together as a family. Can a metal actually be "smart"? It can if it can remember its shape! Nitinol is one of these smart metals and is examine closely in this activity. Using both heat and electicitiy, you can examine how nitinol works! Can wire be trained? Nitinol is a very special type of metal that can actually be trained to "remember" a certain shape! In this activity, you use a candle and nitinol wire to train your own metal. When does a memory metal spring back to its original shape? It becomes it original shape actually after it is heated to a certain temperature. In this activity, you can determine what this very special temperature is for your piece of nitinol wire. Can wire cut through ice by itself? Well, a change in temperature is not the only factor in the changing of the phase of water. Using this activity, you can find out if it is possible to get a piece of wire into the middle an ice cube after it has already been frozen! You Can Eat Crystal and Glass??? What are you actually eating when you enjoy a lollipop? Regular and rock candy lollipops are very alike, but also very different in structure. In this activity, you can make your own tasty lollipops and discover what are their differences! Do artists use science to create art? Nitinol is actually used in a sculpture to make it move! 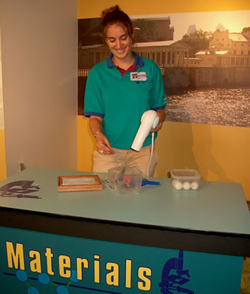 In this activity, you will discover how this can actually happen You will actually get to create your own "sculpture" that can lift pennies!